CREDITS: Request, $5 for each additional leads be paid by each inquiring party. Darrell Hall as Living Legend Country Super Star Singer Alan Jackson. fun times was with the famous Z-boys, They were original Skateboarding pioneers. he was a part of them but mostly enjoyed going to church and fixing motorcycles as a kid. He was well liked in school with good friends of children that their Parents were very well known and well to do, famous folks, Like Ted Evans Motorcycles, Ritz Furniture Company, Nathan Pratt Surfboards to name a few. While in school he played clarinet, saxophone, drums, percussion, harmonica, guitar, and little piano. When he was a child, he always dreamed of being a star, a famous person. He was in the Southeast Civic Light Opera did a couple of shows. One show he really liked doing was called Star Spangled Country where he danced and sang with a group. Since growing up in a Musical family background with Grand Parents in Vaudeville And his Grand Father was a song writer for famous singers back in the day. His father was a professional saxophone player and played in bands. Along with his wife a thespian she was taught him Great Stage Performance and his in-laws that were professional actors & opera singers, they have helped him greatly by giving guiding advice on music. As an actor he�s appeared in two movies, Incredible Harold & Special Ed - were he played the best friend in the movie. He went on and did a Popular HBO-Television western series called Deadwood where he was a bit actor as Prospector, Doctor, Construction worker, Lawyer. For fun from time to time he sang to the actors and extras during off filming times as Alan Jackson. His career impersonating Alan Jackson started in 2000 when he was commented by a stranger in a public bank that said to him, Alan Jackson! Hi Alan Jackson! After that he started putting on the cowboy hat, going out singing at karaoke places. He found trying to copy the real Alan Jackson singing voice didn�t come easy. 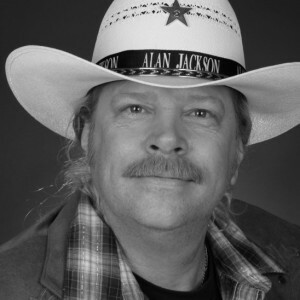 Alan�s singing voice is like a combination of famous Willie Nelson, Randy Travis and legend singer George Jones all in one. After years of practice he�s got a pretty good A+ handle on Alan�s singing voice. His brother called him one day a told him about a Celebrity Impersonators group was meeting in Las Vegas and mentioned he should go. So again, off he went all dressed up as Alan Jackson, boots hat, and all. When he got there he was well received by Top look-a-likes and agents. He was the first ever Alan Jackson impersonator in the business and that�s what gave him the name THE ORIGINAL ALAN JACKSON IMPERSONATOR. During those early years he appeared on the Legends in Concert stage a couple of times, in Vegas with the Celebrity Impersonators. John Stuart the founder of Legends in Concert spotted Darrell as Alan and auditioned him at ON Stage Productions in Vegas and said Yep! You are Alan! They became good friends. Then John Stuart sold Legends and Darrell didn�t get the opportunity to join Legends but did better, and went non-exclusive. His lovely wife has always given him great support, encouraged him to go do Alan. Quickly, everyone was calling him Alan Jackson, since he looked a great deal like the real Alan. He found some folks really thought he was the real Alan. So for fun he made up business cards, handed them out and started getting singing gig�s at parties, and special events. He saw some folks would have that look of amazed on their faces when they saw him that�s when he knew, they thought he was the real Alan. He�s always getting folks asking him to take pictures and autographs. A few times he got mobbed by country folks wanting his autograph; playing the part gracefully signing- Best Wishes Alan on their papers. Every year he returns to the Celebrity Look-a-likes Convention in Vegas to gather more knowledge, networking and to learn more valuable information about the impersonating business to have a professional image. He sings solo by cd music and his wonderful singing voice all of the best Alan Jackson songs, and can sing up to 4 hours at any given event. At times he sings with his lovely wife, she sings too.